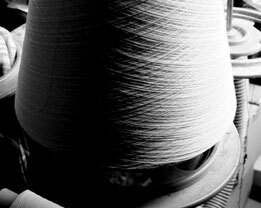 A fateful encounter with the perfect material, leading to research on weaving, dying, and sewing. This material was created during experiments conducted by a researcher and a developer at a university. BreezeBronze® would never have been invented if not for this material.Detailed data regarding this material is an industry secret, and as such cannot be divulged at this time. 1. The strength of the fabric. The material was too weak to endure the everyday use of a product of this type. In order to overcome this, a great deal of research would be necessary. 2. The cost was more expensive than japanese silk. Clearing these hurdles would be vital in using the material to create a widely used product. Though the material used in BreezeBronze® existed 12-13 years ago, most large manufacturers were challenged to find a manageable balance between costs and the strength of odor removal. However, with failure not being an option, we accepted this challenge and strived forward. Starting production at factories with high levels of technology and skilled craftsmen, BreezeBronze® was born. While ensuring the materials was important, the product would lie lifeless without putting together the necessary processes for dying, weaving and sewing. LifeRing, trying to turn a towel that could break down and eliminate odors, began working together at the hip with a factory in Ehime Prefecture’s Imabari City, which brought a high level of technology and skill to the table. As many people already know, Imabari boasts the largest amount of production in Japan. With its warm climate, humidity from Japan’s inland sea perfect for manufacturing towels, and top craftsmen whose skills have been passed down for nearly 100 years. Through a process of trial and error and the hard work and determination of different people coming together as one, a towel that could break down and eliminate odors was born. Techniques were tested and combined, contracts with textile companies were signed, commercialization took place, business started. 6 years passed before BreezeBronze® was ready for the consumer. In order to show that the odors actually disappear, we started giving demonstrations. BreezeBronze®: a product that makes odors simply disappear. At first glance, it’s just an ordinary, plain-looking towel, and even when explained it’s natural for consumers to feel some apprehension. The only way to truly understand the effectiveness of the product is to actually experience it first-hand. We decided to hold demonstrations, going to department stores and home goods stores, as well as special news programs, allowing home makers and business people to experience the moment where the odors disappear. The demonstration itself was quite simple: spray ammonia, the main component of odor in sweat, into a plastic container; place a BreezeBronze® towel into the container and shake around for about one minute; explain what the product does and then open the container. The audience was amazed at the now odorless container and towel. 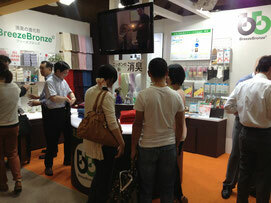 Many who observed the demonstration - perhaps inspired by our passion for the product - purchased BreezeBronze® soon after. BreezeBronze towels are Made in Japan. Production takes place in Ehime Prefecture’s Imabari City, a town famous for the best high quality towels in Japan. Responsible for towel and sheet production is the father son team of Imao and Tetsuya Ozaki at the towel factory they manage. In 1998, Imao was chosen in Japan as a “Craftsman of the Modern Era” and has received a Yellow Ribbon for outstanding service. 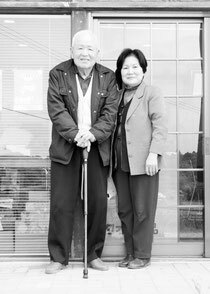 He is truly and authentic artisan, and his son, Tetsuya, has inherited those skills and is now the acting representative director of the factory. Imao: I think the cotton we use is happy being part of such a high quality product. Imabari’s sunlight, water, air, humidity and temperature are all perfect for creating towels. Even amongst the numerous types of Imabari towels, BreezeBronze has outperformed, providing new activity to Imabari with its overwhelming ability to break down and eliminate odors.